I decided I needed more layering pieces for winter this year. I also decided I wanted the pieces to be made of fleece. The pieces also needed to be something I could take and wear with me to a NYC trip this year and a Disney World trip next year. So of course it had to be Disney themed. And what more appropriate winter theme than Frozen? 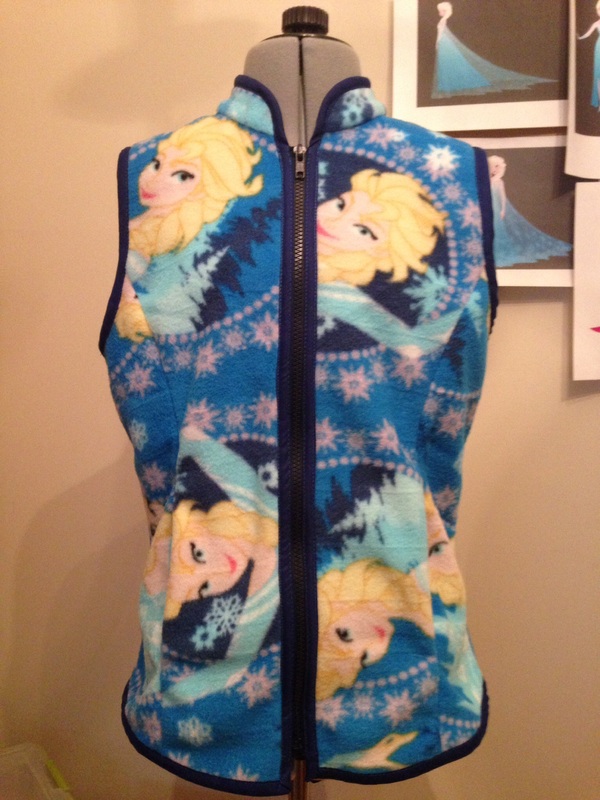 Frozen themed fleece is difficult to come by. I tried getting some from Joann Fabrics online but they sent me an email that they had sold out. Some places online such as Etsy had different fleece, but the sellers were asking more than retail. Hancock Fabrics, however, came through. They had about four different kinds of fleece when I visited. I ended up getting the last of their Elsa themed fleece (1.25 yards) and 2 yards of their Anna themed fleece. I used Simplicity 1499 for both vests. Elsa’s fleece is big and bold because of the print so I don’t wear it out in the open as often despite how much I love Elsa. Usually it’s just used as a layering piece. The fleece is plush and warm. It’s single layered except for the collar and zips up the front. There are pockets but they are kind of small and do little more than warm my hands. Anna’s fleece is hands down my favorite. The print is cute but more subtle, and very berry pink (not bright or pastel pink, which looks awful on me). The front folds over and is a total of four layers of fleece so it’s SUPER warm and cozy. The original pattern called for a collar and zipper, but I replaced those with a hood. I am currently looking for a button or clasp for those times I want to close the front. I completed both of these a week and a half ago and wore the Anna vest to the Carolina Renaissance Festival, and to a later trip to the local Disney Store. This morning I went to Joann Fabrics to get supplies for my Anna winter cosplay when I find two more Frozen fleece patterns. 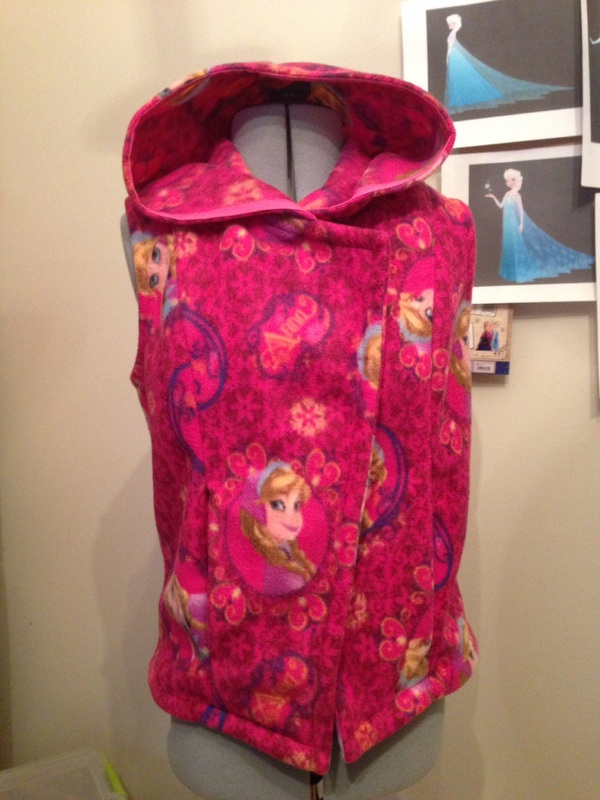 Knowing buying both would be too crazy, I bought the Sisters Forever purple fleece and made a second hooded vest. I love all of the vests, but I have had the most fun wearing Anna’s fleece; it got so much attention when I wore it. People love the style of it; some, when they realize the print, love it even more. First time I wore it to the local Disney Store I had a cast member freak out over it. She demanded to know where I bought it and was a mixture of surprised and disappointed when I said I made it. I told her I made it because there was a decided lack of adult themed Frozen items, to which she nodded and proceeded to steer me towards all the adult items they had. Despite buying exactly what I needed, I have about half a yard of each print left over. I turned the Sisters Forever remanent into a pillow case; considering making a double sided body pillow out of the other. And I’m hoping I don’t find anymore prints otherwise I will be in some trouble. 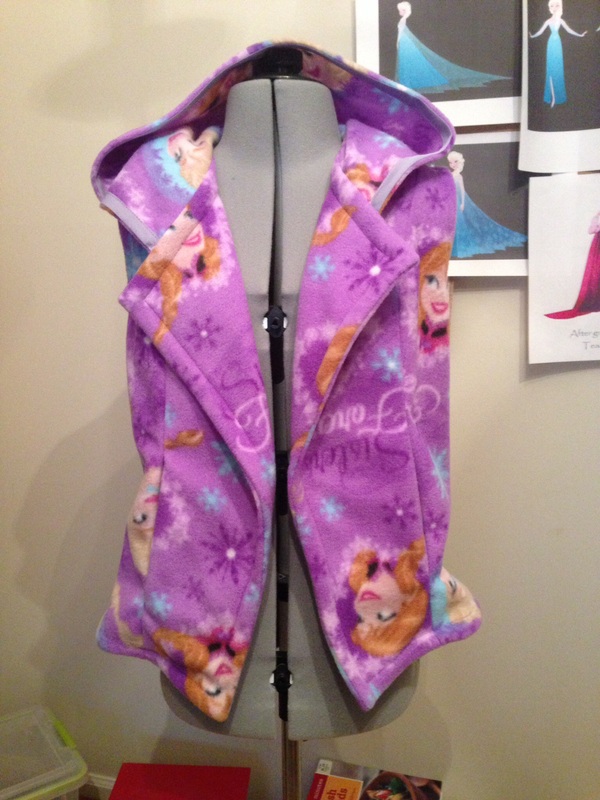 This entry was posted in Sewing and Crafts and tagged anna, clothing, crafting, disney, elsa, fleece, frozen, sewing. Bookmark the permalink.